This book may have inspired a few too many mountain man fantasies. The Alaskan setting made me incredibly homesick and River is a surprisingly loveable supermodel. This book starts light with the focus on the entertaining interplay between Griff and River but when the story pushes into the men’s pasts, it becomes a more complicated and darker read. Griff hides and River runs but both of them struggle to face their issues head on. The result is a tense emotional tug of war as they dance around each other. I enjoyed the tension between these two, but it took time to feel like I actually knew either of them. There are hints from the start about Griff and River’s personal baggage, but nothing is really explained until the midpoint of the story – maybe even later. I get that both men are supposed to be secretive and closed but it is difficult for readers to relate to characters they don’t really know. The pacing in this story feels off. A huge portion of the book focuses on the two-week Alaskan tour where Griff and River meet while the next few months of their lives are skimmed over in a few chapters. I really enjoyed the tour part of the book. The tour group is full of fun characters and great Alaskan experiences. I love the way River and Griff interact (or don’t) during the first part of the book and I love how River just won’t fit in the boxes Griff wants to assign him. I feel like the story starts to unravel when the tour ends. Both men feel a little bit childish and readers are still guessing at Griff and River’s pasts and their motivations. I’m excited about this book as the start of a new series – I just hope we get a little bit more emotional depth and more coherent plotting in the next books. I love the setting and Griff’s family and contacts offer lots of possibilities for interesting storylines. 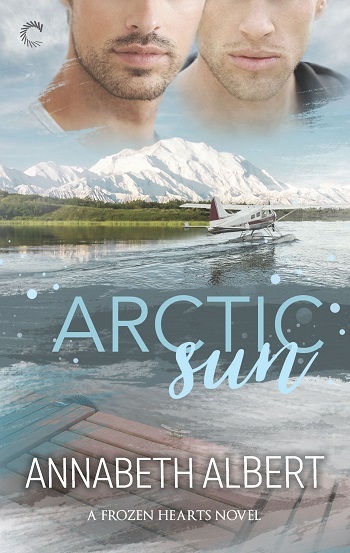 Reviewers on the Wicked Reads Review Team were provided a free copy of Arctic Sun (Frozen Hearts #1) by Annabeth Albert to read and review.